This project was discontinued: the website is provided for historical reasons. 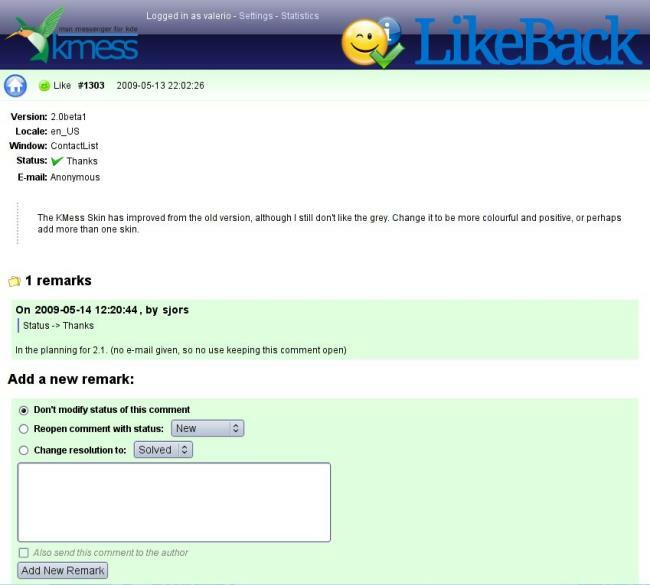 LikeBack is a very effective tool which allows the users of your application to actively contribute to your project. It's very effective to understand what the user want from the program, what they find difficult to use, and what they liked. A frontend, an user interface (written in C++/Qt4/KDE4, soon probably only C++/Qt4) with an icon bar and a feedback dialog, which is included in the application and which the users can adoperate to send their comments in a very easy way. 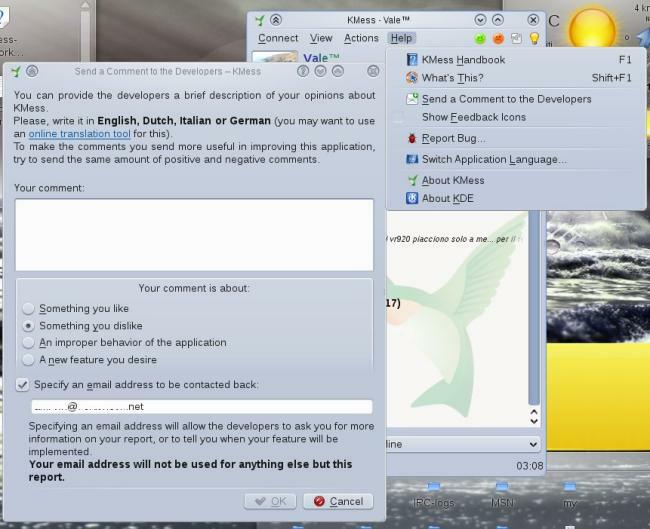 A backend, a web interface which the developers can use to see and answer to what the users had to say. 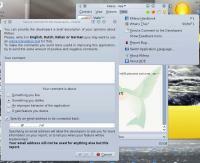 When an user starts up the application, LikeBack can add the little icons on the top right of the main window. These are buttons, each of them represents a different type of feedback. Available feedback types are Like, Dislike, Bug, and Feature. When one of them is clicked, the feedback dialog pops up, allowing the user to enter his or her comment, and also opt to send an email where to be contacted back by the developers, in case of need (for example, if a new feature was asked for). 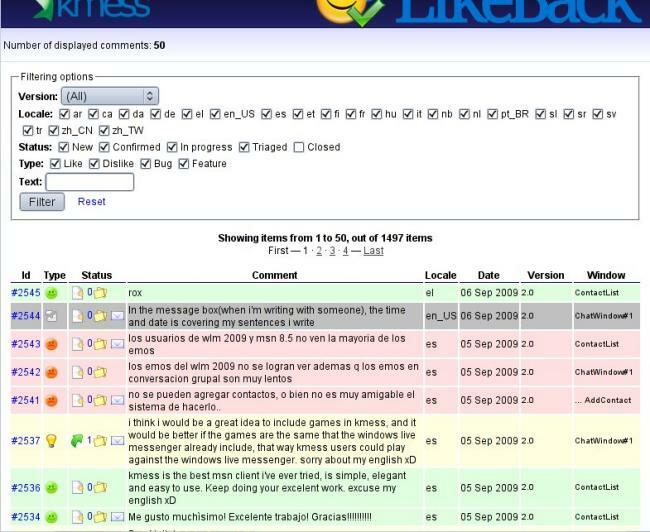 Once installed on a web server with PHP and MySQL, the LikeBack developer interface will be ready to accept feedback from the frontend. A developer who logs in sees the list of comments with an open status: Clicking on one loads the Comment page, where the developer can answer to the comment - and also to the user, by checking the box at the bottom - and change the comment status. The developer interface features weekly e-mail reminders, integration with the project management site Trac, highly customizable comment states and developer options, and a statistics page. 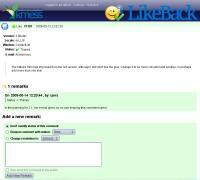 LikeBack is at version 1.3, despite not having been much visible its development went on noticeably fast! For now, there are no released tarballs of it, but we are about to release the 1.4 version, which will get publicly released on SourceForge.net.